We are pleased to announce that we’re one of the only dentists in Lichfield with their very own Orthodontic Specialist. It would be a great honour to meet Dr. Sandra Josic at Asquith Dental. She is a great dental professional who earned her master’s degree in the field of orthodontics at the University of Barcelona, Spain in 2001. All this time she has been creating great smiles while straightening patient’s teeth. She is an exclusive orthodontist in this dental office. Dr. Sandra is following the trends in orthodontics, and at the same time, she is a kind and passionate practitioner with highly professional vision and attitude. Her positive behaviours and experience in private dental clinics in Spain and recently in the UK made have moulded her into a dental professional who prioritises the needs of her patients. Aleksandra is registered with GDC as a specialist orthodontist and her registration number is 252102. Metallic braces: This was the first system which was introduced and it is still a popular option due to the low costs. The main difference when compared to other types is the aesthetics. The duration of the orthodontic treatment depends on the type of the occlusion and other problems a patient may have. Since they remain a long period in the mouth, they possess enough strength and resistance to corrosion. They are made of high-quality stainless steel or titanium alloys. Ceramic braces: This type of braces works the same way as the metal braces. 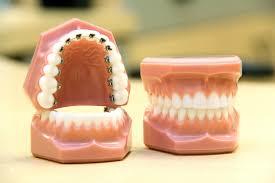 They are made of plastic or ceramic material that holds the wire into place in order to straighten the patient’s teeth. When choosing the ceramic braces, a person is mainly focused on aesthetics, because they work exactly as the metal braces. 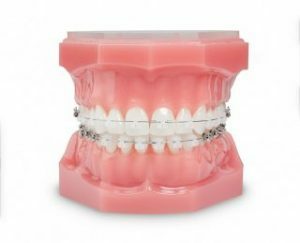 Clear or ceramic braces are a perfect solution for adults and also working professionals who do not want the obvious metallic or silver brackets. Even though they are not completely invisible, it is clear that they are less noticeable than metallic ones. Invisalign: This is a new and advanced system for straightening the teeth. Each feature of the system is created to reveal the smile a patient deserves. This is why so many people transformed their smiles with these removable and near-invisible aligners and use of a conventional metal or ceramic brace. The new ortho system includes wearing a series of clear plastic aligners which are custom-made. Invisalign is found to be more expensive than traditional metallic braces, but patients find themselves happy to pay extra for the nearly-invisible option. Lingual braces: This is also a great and invisible option, Dr. Sandra may offer to you. It is good to know that they look like the conventional metal braces but the difference is that this system is mounted on the backside of the teeth. Because of this, they are hidden from the view which makes them difficult for others to notice them. Imman aligners: This also a new and revolutionary appliance which is described as the missing link between the orthodontics and the cosmetic dentistry. It also can move the teeth quickly and safel This system allows the patient obtain great results with one appliance. It is removable and can be inserted easily as retainers. The most important thing is that it can be used for a short period of time to align the teeth before an aesthetic or restorative treatment. Damon Braces: They are discreet, comfortable and produce high-quality results within a short time. Damon braces are made from durable materials and utilising light, shape memory titanium wires. They allow teeth to be moved more quickly and with fewer adjustments compared with traditional braces meaning that Damon treatment times are significantly shorter on average by around 6 months. You can find more information about the Damon ortho system on the Damon website. If you are considering orthodontic treatment you can schedule a free orthodontic consultation with Dr. Sandra Josic and learn more about which type of braces are the best option for you. Interested in Orthodontics in Lichfield? Book a free consultation with our team today and our expert dentists would love to answer any questions you might have in person.